After Redistricting, State Rep Mike Hamilton and State Rep Allan Ritter (both are moderate Straus Chairmen) were put in the same district together. Mike Hamilton packed up and moved to Hardin County after redistricting but right before the election to run against Super Conservative State Rep. James White (White voted against Straus). The question is, did Rep. Ritter bribe or pay off Mike Hamilton to get him to move to Hardin County so that Ritter and Hamilton do not have to face each other, and so that their leader Joe Straus would be happy because James White would have an opponent? 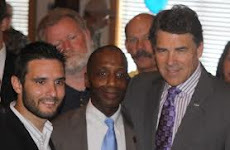 Because Straus did not want to openly attack a black, super conservative Republican, he devised a plan to secretly pair James White with one of his Chairman. After redistricting, James White appeared to have his own district. He did not get paired with any other Republicans. Not so fast! Rep. Hamilton, a Straus Chairman, was going to have to face another Straus Chairman Rep. Ritter. Instead, Hamilton moved to Hardin County to run against White. Are you telling me that Straus paired two of his Chairmen in redistricting, Ritter and Hamilton? Are you telling me that Straus did not know that Hamilton was going to move to Lumberton, TX to run against White? OF COURSE STRAUS KNEW! That was the Straus Plan. The plan was to pair two of his Chairmen together knowing full well that one of those chairmen was going to move to Hardin County to run against White. This plan allowed Straus to say he did not hurt Black State Rep. White in redistricting when in fact he actually did hurt White because he knew that his Chairman Hamilton was going to be moving to Hardin County which is in James White's new district. Other Chairmen for Straus are also funneling money to fellow Chairman Hamilton in order to beat James White. Another of these Chairmen is Charlie Geren. Rep. Geren even gave $50,000 to Hamilton in just ONE check out of the many donations and loans that Hamilton has received from fellow Straus Lieutenants. Straus has a HUGE personal financial interest in casinos and expanded gambling in Texas because of the racetracks that his family owns. Straus wants Casinos and expanded gambling so that he can make some extra money at the expense of gamblers who can't pay for food for the family because they have an addiction to gambling. One of his racetracks was even bought by a Las Vegas casino that has bet on cashing in once Straus gets the Texas Legislature to pass a casino and expanded gambling bill. The key to passing this bill is Straus Chairman Mike Hamilton. State Rep. Mike Hamilton is chair of the licensing and regulations committee. This is the committee that a gambling bill would come out of. Of, what do you know, last session Hamilton WROTE a gambling/casino bill and did everything he could to try to pass it. He could not get enough votes so he killed the bill until next year. Joe Straus NEEDS Hamilton to win to keep the hope alive of passing a Casino and Expanded Gambling bill. Isn't it just coincidental that the Joe Straus supported Political Consultants are being used all across Texas in campaigns that attack and are trying to oust conservative Republicans? Murphy Turner is so corrupt and deceptive in their campaigning that they even have had a restraining order issued against them. Apparently, Murphy Turner is trying to help their liberal and moderate candidates by starting a fake organization called "Texans for Fiscal Accountability." This fake organization has endorsed the bad candidates in an attempt to try to trick people into thinking that the real, legitimate "Texans for Fiscal Responsibility/Empower Texans" has endorsed these bad candidates when in fact "Texans for Fiscal Responsibility" actually opposes these bad guys. This deception caused a judge to issue a restraining order against Murphy Turner. Murphy Turner is also sending out lies and deceptive material against James White. For instance, only flyer from Mike Hamilton says that Rep. James White was rated the second most liberal when in fact, James White is one of the TOP conservative Republicans in all of the legislature. All of the conservative organizations and even the liberal media acknowledge James White as a top conservative and NOT even close to being liberal. It does, however intricate your theory, make some sense. Which family members, and which racetracks? I've seen this bandied about. But no one is naming names. Do you know?